A demonstrator pounded away at the Berlin Wall as East Berlin border guards stood above the Brandenburg Gate on Nov. 11, 1989. But there is another way to see the events of November 1989: as a kind of historical accident. The protests in East Germany that summer had been peaceful; there was no particular reason for border patrol agents to suddenly back away and let people through. Yet on the night of Nov. 9, 1989, after an East German official made a confusing announcement about new travel rules, a guard disobeyed direct orders and stepped aside, letting throngs of protesters cross into West Berlin. Historian Mary Sarotte takes a close look at the events leading up to that night in a new book, and makes the case that the story of the wall’s fall hinges on many more small, nearly anonymous acts than we might think. Sarotte, a professor at the University of Southern California and currently a visiting professor at Harvard, is the author of the new book “The Collapse: The Accidental Opening of the Berlin Wall”; in it, she uses interviews with activists, border guards, and (often bumbling) East German party officials to reconstruct the chain of actions that culminated in the unexpected opening of the wall. Her conclusion offers insights not just about the Cold War, but about history: “Significant events,” she writes, “do not always happen for significant reasons.” And misunderstanding what happened has had serious consequences, she says: American overestimation of how much we had to do with the wall’s fall has caused the United States to overreach in foreign policy since. She spoke to Ideas by phone from Cambridge. This interview has been condensed and edited. IDEAS: You argue that in explaining why the wall fell, there’s been an overemphasis on the role of world leaders and big geopolitical forces. From 1961 to 1989, the Berlin Wall split a nation in two and stood as the Cold War’s most visible political faultline. It created unforgettable scenes of division while it stood, and reunion when it fell. SAROTTE: There’s that old saying, “Success has many fathers.” The Berlin Wall coming down was a huge success, and afterward all kinds of people said, “I knew it was going to happen, I made it happen....” I wanted to go back to basics, go back to evidence, and look at people who were directly involved. IDEAS:You get the sense that in the months of protests leading up the opening of the wall, there were a number of places where a single gunshot could have changed everything. SAROTTE: Particularly on the night of Oct. 9 in Leipzig and the night of Nov. 9 in Berlin. Those two nights were really tense and you had masses of people in direct contact with armed security forces. You feel these were the times where a single rash action could have had far-reaching consequences. People involved understood that, particularly the dissidents. They worked hard to maintain nonviolence because they knew it could rapidly spiral out of control. It impressed the security forces who said again and again that their officers had told them this would be a bloodthirsty mob, and instead they saw these peaceful people. IDEAS: If the East German government had used overwhelming force then, do you think they could have maintained power? SAROTTE: I suppose at some level, if they’d called in the army and slaughtered massive numbers of people, in the short term they could have retained control. 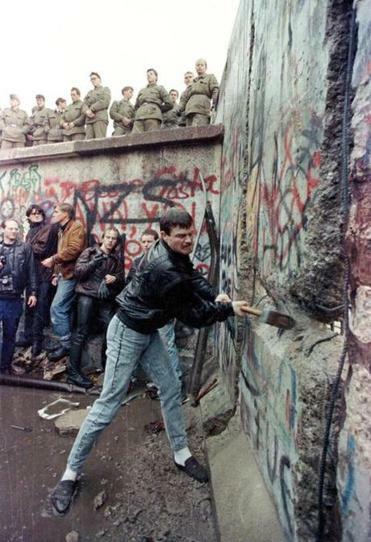 IDEAS:You tell this amazing story about how on Nov. 9, 1989, the East German Politburo unwittingly opened the wall. As in, Gunter Schabowski, a Politburo member, holds a press conference and reads new travel rules that sound like they’re effectively opening the wall, but he’s disorganized—can’t find the text of the law, he mumbles—and barely seems to comprehend what he’s saying. SAROTTE: People under stress do stupid things. Never underestimate the power of stress to influence history. In historical perspective, you sit down and calmly consider matters, but that’s not how it happens in real time. You’re in a rush, you’re sleep deprived, you do things and think later, why did I do that? At this level of detail, those human factors matter. IDEAS: The clearest moment in which history hinges on one individual’s decision comes at the wall itself, the night of Nov. 9. Harald Jäger was the border guard who faced this crush of people wanting to get through. SAROTTE:He estimates he tried 30 times to get orders starting shortly after the press conference, which ended at 7 p.m.; and a little before 11:30 p.m., he decides to make his own decisions. His superiors, instead of giving him instructions, they insult him—he gets patched into this phone call with superiors who don’t know he’s on the line and they say, is this guy a coward? This gets his back up. You can imagine: This guy had been working there for 25 years and in all those years he has one minor demerit on his record—this is a loyal servant to the state. He’s in the most stressful situation of his life, he’s doing the right thing, trying to get orders from his superiors, they’re insulting him, the situation is getting more and more desperate, and he’s starting to feel abandoned. He also realizes his state is going under. He knows things are deeply wrong at the top, but he’s still willing to put on his uniform and stand on a 24-hour shift. This would be a triviality, except that it was also happening to him—he’s experiencing a cancer scare. It turns out he doesn’t have cancer, but he doesn’t know that that night, he thinks he’s dying of cancer, and so why should he worry about the consequences? Anyone who’s gone through a serious health scare knows how that can distort your decision-making. He finally gets to that moment where he says he’s not going to shoot all these people. He’s going to open [the Bornholmer border crossing]. 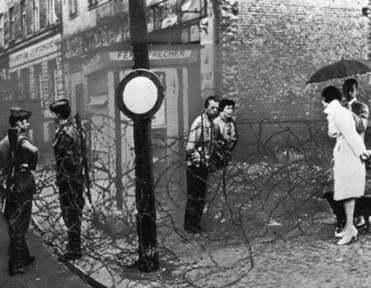 This guy no one’s heard of, this deputy passport control officer, opens the Berlin Wall. IDEAS: You argue the foreign policy establishment in the United States learned the wrong lessons from the fall of the wall: Our government sees itself as the “primary author” of the fall of the wall, but in your view, they were less responsible than they’d like to think. How do you see this misperception affecting US foreign policy? SAROTTE: The infamous line “from Berlin to Baghdad” rises from this dangerous misbelief that the United States was the sole author of these events, that these events were nearly cost-free, and that we could repeat these anywhere else in the world. They were not cost-free, and they depended heavily on the locals. The locals matter. The United States is better at setting the context than it is at getting down and making the particular outcome happen. It’s these local actors that made the outcome happen, and when the United States forgets that, things turn out badly. IDEAS: We’ve been talking about tiny actions people took in the larger context of the Cold War. How do you identify real individual agency in events that, in a larger context, start to look inevitable? SAROTTE: The way you recognize it, obviously, is hindsight. We have the virtue of knowing how these stories end. You put them back together and you gain an understanding of how the most important events in human history unfolded. It’s usually a combination of all these factors, and it’s not the combination you expected, and you can’t see that until you get into the details. I’m trying to restore that sense of uncertainty. There were many possible paths to the future. Some of them included bloodshed and violence, and the people on the ground at the time didn’t know what path they were going down. Once you’ve identified the moments that matter, you have to drop the hindsight and forget how events turned out—because the people involved didn’t know that.